I still remember the first time I tasted pasta cacio e pepe. That summer, I stayed with a family in Rome and had a truly Italian experience. I ate like a Roman and visited all the wonderful sights that the eternal city had to offer. One day in particular, I met an Italian friend for lunch and I asked her to order me something typical of the region, to eat. When the plate arrived with pasta cacio e pepe, I thought it looked nice but maybe a little plain. Boy, was I wrong! It packed a punch of flavour and I recreated it many times in my own kitchen back home. 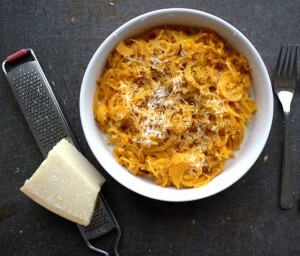 Fast forward many years later, I created this dish: Butternut Squash Cacio e Pepe as an homage to my Roman holiday. It’s obviously not the same without the pasta but I think it’s still delicious in its simplicity. Butternut squash noodles suit this recipe much better than zucchini (courgette) noodles. The Italians are obsessed with cooking their pasta “al dente”. Essentially, they mean that pasta should have a little bite to it. They’re right. Let’s face it. There is nothing worse than soggy, overcooked pasta. 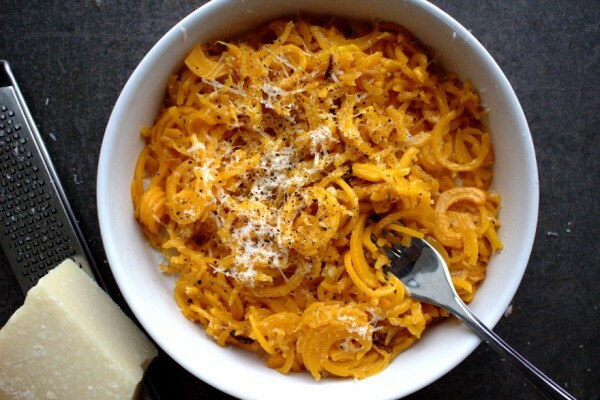 Butternut squash noodles maintain their texture as they are only cooked briefly and that lends itself very well to this recipe. Cacio e pepe literally means “cheese and black pepper” which sounds quite boring but is actually deliciously full of flavour. As always, when the ingredients are few, use the best you can afford. Typically, you should use a mixture of Grana Padano and Pecorino Romano cheeses. If you don’t have access to either of those, Parmesan is a good substitute but a native would notice the difference. If you have a local Italian supplier near you, it’s worth going to find specialty cheeses and a great olive oil. We’re regulars at our local Italian store. They even offer us a free espresso when we arrive. Now, that’s what I call Italian hospitality! A delicious and healthy take on this Italian classic. Gluten and grain-free. SCD-friendly. Heat one tablespoon of butter in an iron skillet until melted. Add the black pepper. Next, add the butternut squash noodles and fry on a medium heat for 5-10 minutes, stirring often so that they don't burn. Remove from the heat and add the remaining butter and the cheeses. Stir well and serve immediately. *You can substitute both cheeses for Parmesan if you wish. Thanks, Maria! This was delicious. I added a bit of garlic powder and cayenne and I only had Grana Padano. I cooked a little longer than ten minutes. So glad you liked it Ann. It’s become one of my favourite quick meals.